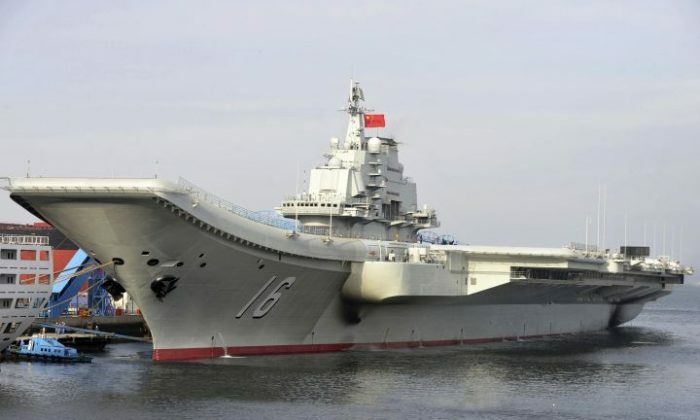 The Taiwanese government has issued a warning on Tuesday about Chinese warships, including the new Liaoning aircraft carrier, patrolling close to its maritime territory. The Chinese warships, led by the Liaoning, were seen sailing toward the island province of Hainan via the South China Sea, Reuters reported. His warnings come as hardline Chinese communist state-run mouthpiece the Global Times—which has a history of making dubious, threatening statements against the United States and its allies—published a report on Christmas, saying that the aircraft carrier Liaoning could soon be patrolling near the U.S. West Coast, without elaborating. The Global Times said Chinese naval capabilities need to be built up, including more aircraft carriers. It added that naval supply bases in South America should be implemented for the carriers. Earlier this month, Chinese military forces conducted long-range drills around the East and South China Seas, triggering worry among neighbors Taiwan and Japan. Tensions around Taiwan have increased in recent weeks after President-elect Donald Trump received a phone call from the island’s president that upset Chinese Communist officials. “We continue to closely monitor developments in the region. We do not have specific comments on China’s recent naval activities, but we continue to observe a range of ongoing Chinese military activity in the region‎,” Pentagon spokesman Gary Ross told Reuters. Earlier this month, satellite imagery showing China building large anti-aircraft guns on manmade islands in contested South China Sea waters was published by the American-based Asia Maritime Transparency Initiative think tank, according to Navy Times.